Online retail was an over $100 billion industry last year. Jupiter Media expects that to grow to over $140 billion by 2010. Comscore has attributed the growth to lower prices and just how damn simple it is to buy things online. This week, two new Amazon powered shopping visualization services rolled across our desks. Here’s a look at each. BrowseGoods: The product of a company called Dotted Pair, BrowseGoods’ shopping interface shows you a map of categories and subcategories of goods (think google maps for goods). Their first example is for shoes and kind of looks like a blocky map of the world if Dolce and Gabbana had their way. Each box is titled with a category title, and breaks into yet smaller boxes with the subcategory titles, until you zoom in so close you can see a cloud of shoe thumbnails. While zoomed all the way in, you can bring up product details from Amazon that also rotates through all of the product images. The BrowseGoods method seems useful if I don’t have any idea what kind of shoe I want to get, but the lack of filtering is cumbersome when I know more about the type of shoe I want. 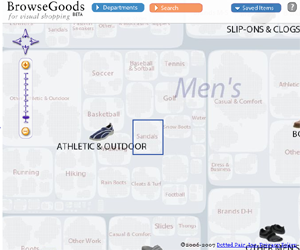 Dealing with the blob-like geography of the categories while zoomed in and perusing the shoe selection was tough. 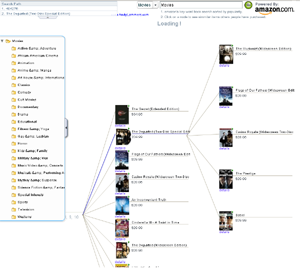 BlackDogAir: The project of Andy Lammers, BlackDogAir looks at Amazon’s music, books, and movies like a family tree. The tree starts with the display of Amazon’s browse pages fanned out vertically. Each item can be clicked on for details or bring up another level of the tree displaying the its related items. Current shopping visualizations don’t seem to be slowing down the pace of online commerce, but as the volume and variety of goods online grows, new tools will be needed to sort and experience them. I still see Like.com as the best of the new visual shopping engines.